Start the morning with these Ricotta Berry Oatmeal Cups, a nutritious and delicious breakfast the whole family will enjoy even when rushing out the door! Breakfast is one of my favorite meals of the day. Yours too? How perfect that you’re visiting my site and reading this recipe post right now! I won’t go into all the benefits of breakfast with you here since I’ve shared that with you before, and I’ve given you lots of breakfast ideas in the past, including these Quick & Easy Balanced Breakfasts and these other breakfast recipes, so today we’ll just get straight to my new breakfast recipe. Back in 2011 when I developed recipes for my 1st cookbook, We Can Cook: Introduce Your Child to the Joy of Cooking with 75 Simple Recipes and Activities, one of my favorite recipes in the bunch was my Cheesy Egg Muffins. I’ve since modified the Easy Veggie Egg Muffins recipe, but it’s still one I make often so there’s always a batch in the freezer for those busy mornings I’m rushing out the door with the kids. I’ve come to realize over the years that anything that can be made in a muffin tin, be batch baked, freezes well, and is full of nutrition is a necessity for a quick and easy breakfast that can start the day for everyone in the family. 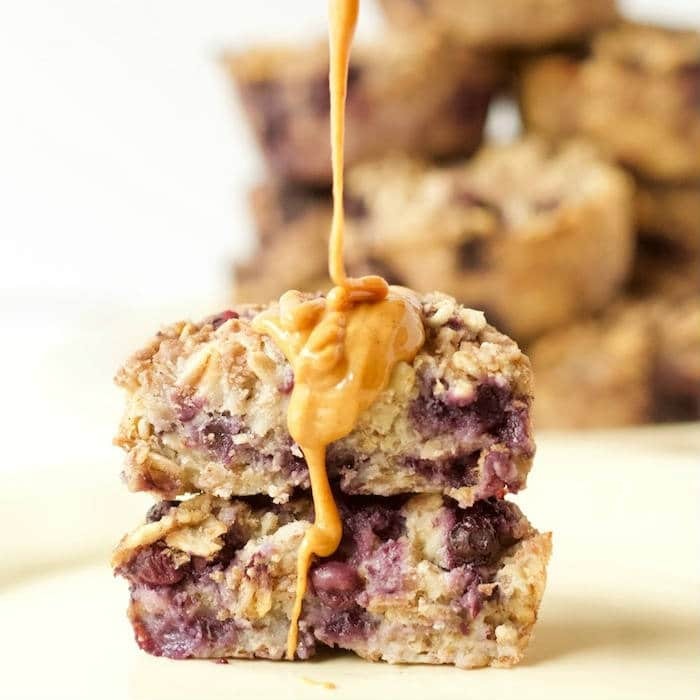 That’s why these ricotta berry oatmeal cups had to be added to my recipe library. 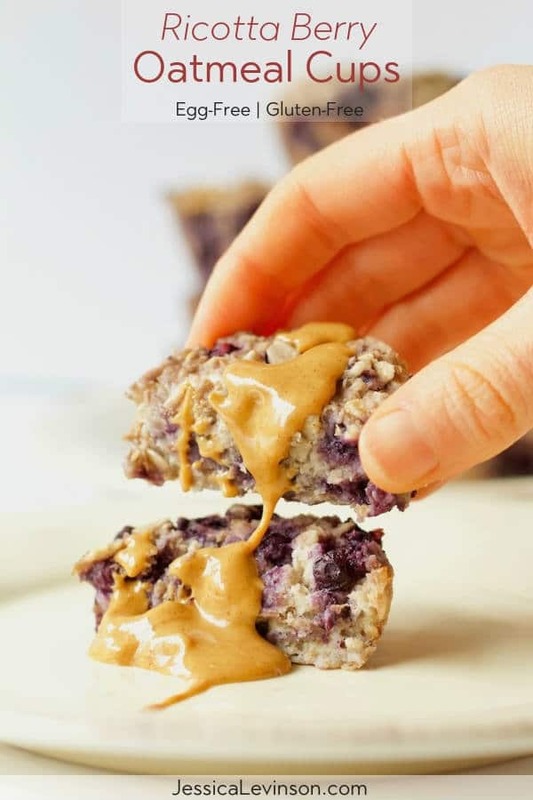 These Ricotta Berry Oatmeal Cups are made with whole grains, low-fat dairy, antioxidant-rich wild blueberries, warming spices, and a touch of added sweetness from maple syrup. Plus they’re egg-free and gluten-free! And in case you missed the video above, these oatmeal cups are super easy to make too! What makes these oatmeal cups or muffins (call them what you wish!) such a great breakfast choice is that they’re a good source of fiber, protein, and calcium, which means they’ll fill you and your kids up and keep you satiated throughout the morning. Added bonus: unlike most muffins and many morning baked goods, these ricotta berry oatmeal cups are not too sweet. In fact, if you have a big sweet tooth, you may want to add a little more syrup or sprinkle brown sugar on top. Oh, and before I forget, I want to share another reason to love this recipe – you can use it as a formula and swap in your favorite add-ins. Prefer strawberries or dried fruit? Go for it. Not a fan of nutmeg? Leave it out. Don’t have ricotta on hand? Use low-fat Greek yogurt, puree cottage cheese, or skip the dairy altogether for a dairy-free version. No matter your flavor preferences, I have no doubt you’ll love these oatmeal cups as a change of pace from your usual morning bowl of oatmeal. So go ahead, whip up a batch, store a few in the fridge for tomorrow’s breakfast, and stick the rest in the freezer for those often rushed mornings! 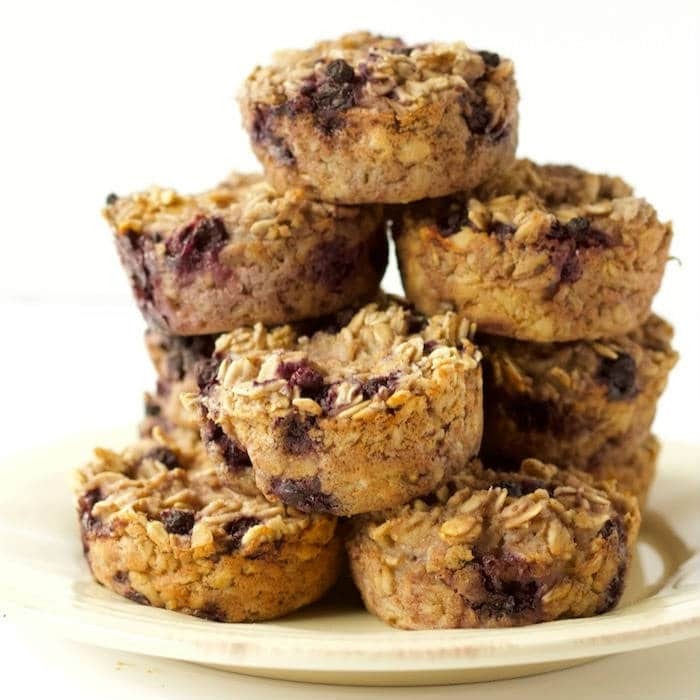 Whole grain oatmeal cups are studded with wild blueberries and full of low-fat dairy and warming spices. A good source of protein, fiber, and calcium, making them the perfect way to start the day! Preheat oven to bake at 350 degrees F. Spray a 12-cup muffin pan with cooking spray or line with paper muffin liners. Combine the oats, cinnamon, nutmeg, salt, baking powder, and milk in a large mixing bowl. Add the ricotta cheese and maple syrup and stir well to combine. Gently fold in the blueberries. 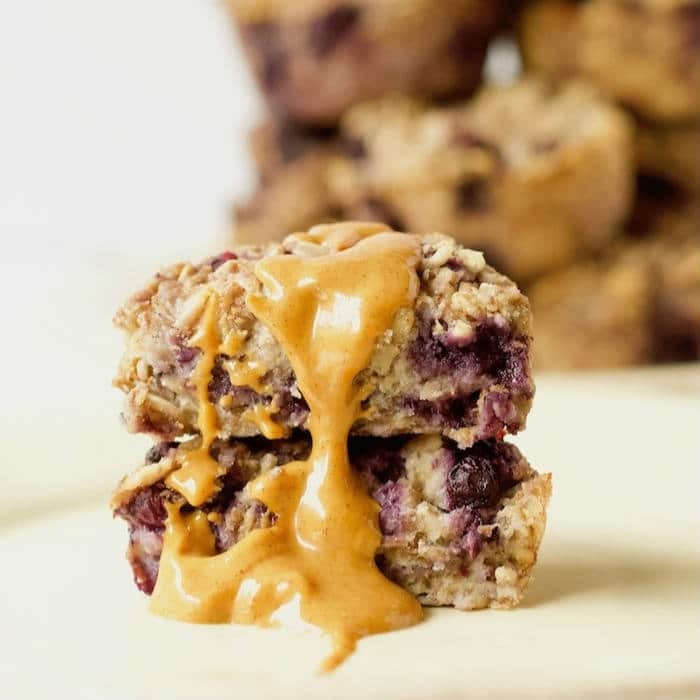 Using a ladle or small measuring cup, divide the oatmeal mixture among the muffin cups. Bake for 30-35 minutes until a toothpick comes out clean. Let cool in the pan for a few minutes before running a knife around the edge of the muffins to remove and let cool completely on a cooling rack. Serving suggestion: Serve oatmeal cups with a side of fruit and spread with your favorite nut butter or topped with a dollop of yogurt. What would you add to these oatmeal cups? As always, we’re on the same page- berries and ricotta for breakfast…yes please! Haha..I was just commenting on your post as your comment came through and was thinking the same thing!! I love berries and ricotta and I’m always looking for ways to use up leftover ricotta. These look perfect and so flavorful! Nice job. Pinned to try soon! Thanks so much Marisa! Hope you give them a try! It was actually leftover ricotta that prompted the addition here, so you’re spot on! Enjoy! Mmmm these look divine!!! Blueberries in muffins are the best – so sweet and juicy. I love the addition of ricotta too. Well done! Thanks so much Chrissa! Hope you give them a try! I loveee ricotta cheese and I bet it makes these moist and delicious! Me too! These oatmeal cups are definitely moist! Hope you try them! What a great combination of flavors! These really look delicious! I’ve never thought of putting ricotta in oatmeal! Thank you Julie! I had never added ricotta to oatmeal before either, but it was staring at me in the fridge, so figured I’d give it a try! Yum-I can’t wait to make these Jessica! I’ve been on a ricotta cheese kick lately….Ricotta Meatballs last week….Ricotta with Blood Oranges for breakfast…and lasagna with spinach ricotta filling for dinner tonight 🙂 I think my kids will love these too! Thanks EA! I love ricotta too – can’t wait to see your recipe for ricotta meatballs – that sounds yummy! And I’m going to have to try that combo of ricotta with blood orange for breakfast! Hope your kids love these oatmeal cups as much as mine do! I was just thinking about making some oatmeal cups and was testing dairy-free ricotta that should work great in this! Oh, i hope you do! Can’t wait to hear how you like them! What a cute recipe! I am a sucker for anything small and tiny, it makes me feel like Alice and Wonderland when she eats those petite pastries ahha! I had no idea you wrote a cookbook, you are wonder woman! I love it! I’ll have to take a look at it, is it on Amazon or ebook? YUM! I made these last night and had them ready to grab and go for breakfast this morning. I actually used fresh raspberries in mine instead of blueberries (it’s what I had). I love that they are not overly sweet. And they are great without the egg! 😉 I will definitely be adding this recipe to my regular breakfast rotation! Thanks! Thanks for letting me know Brittany! I’m so glad you made them and that they came out great! I bet they were delish with raspberries. That’s one of the things I love about this recipe is that there are so many variations you can make! So excited you gave them a try! Thanks for the heads up and the recipe! This is a day I need to get on top of. I should go prep some muffins for the morning. You’re most welcome! Hope you enjoy – as far as I’m concerned any day can be oatmeal muffin day. My girls certainly wouldn’t mind! These look like a great way to start the morning! So easy and delicious! Just what I’m looking for in my breakfasts! Even better that I can grab and go on busy mornings! Thanks Taylor. You will definitely love having a batch in the freezer if you like grab and go breakfast options. Hope you enjoy! I love ricotta and berries together!! and this looks like a fabulous easy grab & go breakfast! It’s such a yummy combo! I always have a batch of these in the freezer for those hectic mornings! Thanks Meme! These look so delicious! Filling oatmeal, berries and ricotta sounds like a great combo! Thanks Sarah. Hope you give it a try. It’s a fave with the kids! Thanks Amanda. Sorry you can’t enjoy it anymore. Bet there’s a good dairy-free sub out there! Don’t you just love it when you make a cooking mistake that turns out to be fantastic!? I love it when that happens. These sound delicious! What a fun recipe redux this month!! I don’t bake with ricotta very much so I am so intrigued!! These look like the perfect breakfast to-go!! Thanks Rebecca! That was a fun challenge for sure. I hope you give these a try. It’s so helpful having a batch on hand! We make oatmeal “muffins” all the time and they’ve never seen an egg. Love the spices in here. Perfect for breakfast or even the lunchbox! So glad to hear you guys are fans of oatmeal muffins! And that you go eggless when you make them too! Definitely a good lunchbox option too. Thanks Jenn! These look so good. I’m always up for a good blueberry recipe! Thanks Kerri! 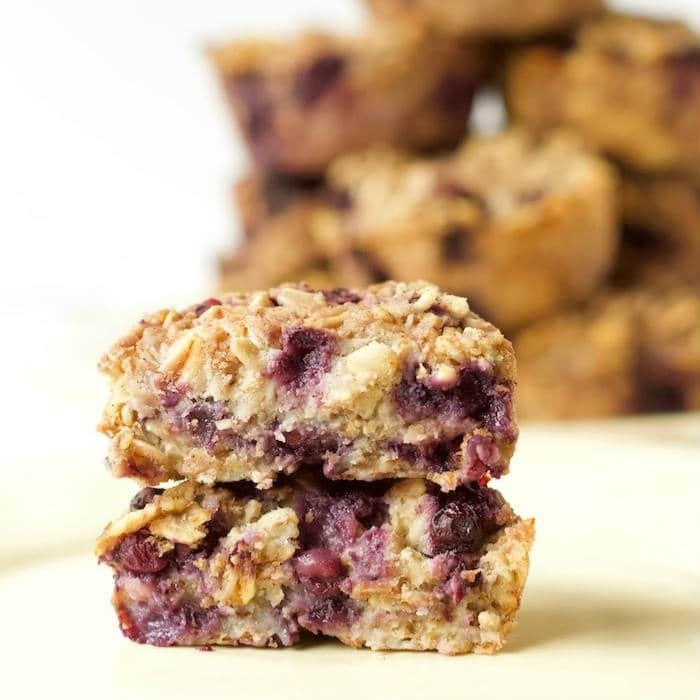 It’s one of my favorite recipes, and I’m so with you on the blueberry love! Wow! I just saved this recipe for an after-school snack for my kids! I haven’t made muffins using ricotta. What a great idea! Thanks Denine! I always have a batch of these in my freezer. Hope the kids like them! These were just not sweet enough for me. I suggest adding a half cup of brown sugar! The rest of the flavors are really amazing but I honestly don’t taste any sweetness at all! “Not overly sweet ” is a huge understatement!!! There are very few reviews comparatively on here that have actually tasted these. Most reviews are people expressing excitement to make them haha! Can I substitute soymilk for the 2 cups of milk in this recipe? As for the yogurt, what do you suggest for a dairy-free substitution? Daughter is lactose intolerant. You can substitute any non-dairy milk for the regular milk. There isn’t any yogurt in the recipe, but if you’re referring to the ricotta, there’s very little lactose in ricotta cheese, so your daughter may be able to tolerate it. Otherwise you can use a lactose-free cottage cheese – Green Valley Creamery makes one. Would it be possible to add back in the eggs, or would that change the taste & texture? Looking for something with a bit of extra protein that will keep my wife full until lunch at work, as well as the kids! Hi Kaitie, I actually have never made them with eggs, but I have made other baked oatmeals with an egg or two. You may need to reduce the amount of milk if you’re adding eggs, otherwise it may be too liquidy. If you do add eggs, I would start with 1 1/2 cups milk and add more if the mixture is too dry. I’m going to test this with eggs to see how it comes out and will update the post when I do. Thanks so much Rosali! Would love to hear how you like these when you give them a try!